DEA Agent Billy Russell executed a man for committing a heinous crime against him and is sentenced to 20 years hard labor. Without explanation, he’s paroled 5 years early. 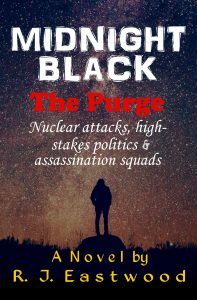 An isolated nuclear attack has spread primal fear that it could lead to a nuclear holocaust. Autocratic billionaires have convinced the world the only solution is to form a one-world government. Their self-serving, authoritarian, faulty economic policies lead to a populace living in poverty, crime, disease, and rampant drug addiction. As a condition of his parole, Billy is assigned to a drug enforcement unit in Boston, MA. Unbeknownst to him, the unit’s real mission is to eliminate drug dealers without benefit of the judicial system. Billy is approached by dissidents planning to overthrow the authoritarian government. He joins them to end the demonic reign of tyranny only to become embroiled in the wildest conspiracy he could have ever imagined. Eastwood’s writing has been favorably compared to author Lee Child.